Cherry Pop Shoe https://www.review-australia.com/au/cherry-pop-shoe-navy/RE19ACC177.RENVY013.html It. Has. Cherries! Need we say more? No, but we will! 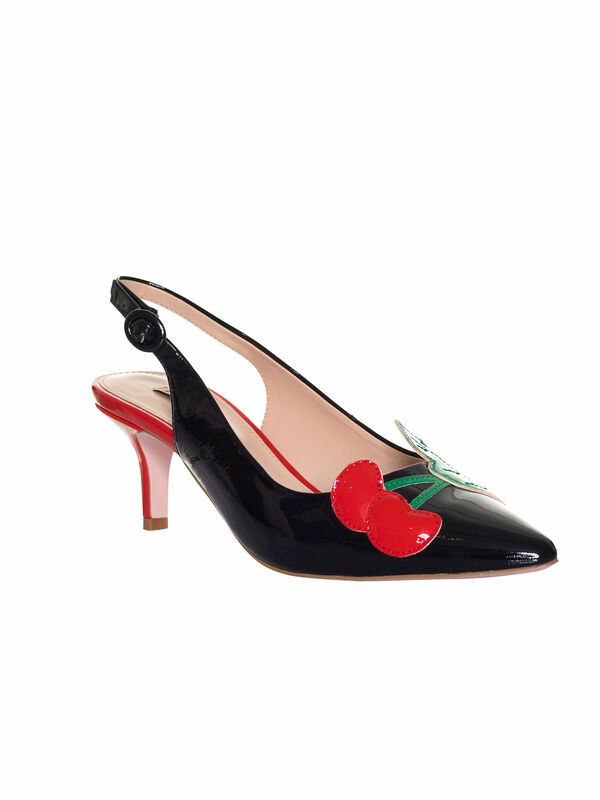 These cute kittens feature a classic silhouette, retro sling back and, of course, statement cherries. You'll love the pink sole with cute love heart detail. Cherry Pop Shoe is rated 4.9 out of 5 by 23. Rated 5 out of 5 by Lulu3 from Cute 50s style shoes! As soon as I saw these cherry shoes,I knew I had to get them. They’re classy,not too high and with a very cute cherry design.They go beautifully with my fifties dresses and skirts and have already received compliments. 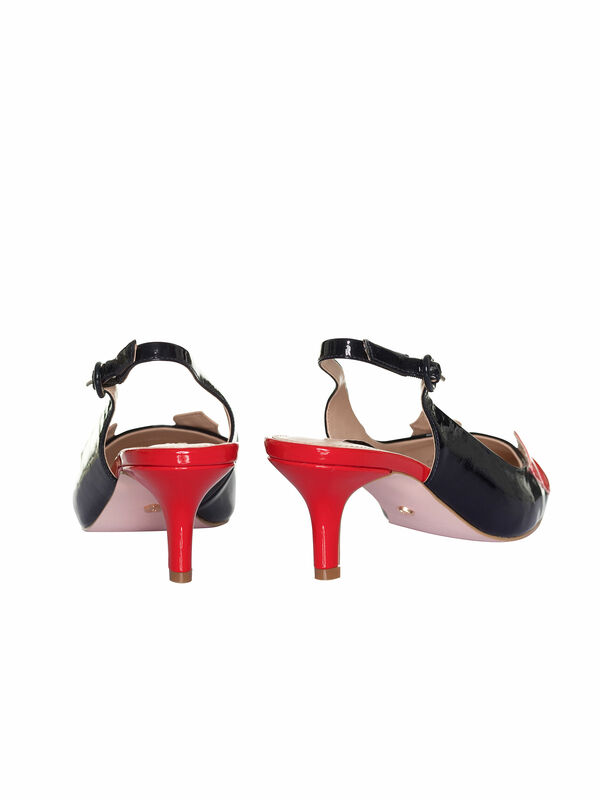 Review,I would love more colour choices in this style of sling back shoe.Love them! Rated 5 out of 5 by Sweetpea. from Oh so cute and comfortable Having recently had surgery on my foot I was very reluctant to try wearing any type of heels .I was so wrong,the Cherry Pop kitten heels are so comfortable.I managed a whole evening on my feet and not once wished I could take my shoes off.I also had many comments on how pretty they are. Rated 5 out of 5 by MEOW from Perfect Summer Heels! I bought these shoes recently and OMG - THEY ARE AWESOME. So versatile. They wear well with skirts, pants, dresses, shorts. Importantly they are adorable. I get so many good comments when I wear them. Rated 5 out of 5 by Kimmi from Very Cute and Comfortable I LOVE this shoe! The design is so cute. I have a very big foot (size 10) and usually find it hard to get stylish shoes that fit and are comfortable. These shoes check all the boxes! Rated 5 out of 5 by Ettahurst26 from Cherry Love As a long time Cherry fan, these Cherry shoes were the ultimate finishing touch to my Cherry capri's and various cherry print tops from Review. Im truly in love with these shoes! Rated 5 out of 5 by Maria from Comfort and Style! These shoes are just too much! I love the unique color combintion, and they look so cute on. These shoes are very stylish and comfortable to wear, they just look adorable.